When mice gain access to your home, it is difficult to prevent them from wreaking havoc on the interior of your house. If not dealt with quickly, a mouse population can double its size in a matter of days. DIY traps are an option, however they can be difficult to place and you will still need to hire a professional to remove the carcasses. Trust the expert mice exterminators at Critter Control® Gainesville. Our team of professionals have the tools and the knowledge to remove mice from your home safely. Droppings and urine will leave a foul smell, stain your ceiling and walls, and corrode your attic insulation. Scratching and scurrying sounds from the walls and ceiling will keep your family up at night. Mice easily spread diseases like leptospirosis through contaminating the air with their waste. Mice will ruin the infrastructure of your home with their constant gnawing. They enjoy building their nests out of your attic insulation, and will go whatever it takes to get to it. 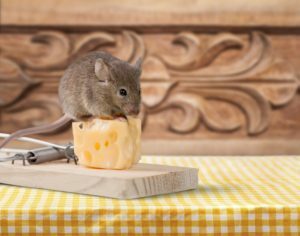 As they file down their large incisors, mice will look on things to chew on, like your stored property, or even electrical wiring. These frayed wires can result in a serious fire hazard. The only way to safely remove mice from your home is to have a professional mouse exterminator take care of the problem. The trained technicians at Critter Control® Gainesville have all the proper tools and knowledge to quickly and safely exterminate and remove all mice from your home. We’ll even repair any damages they left behind. For your free consultation, call us today at 352-372-3922.